THOUGH the existence of ironstone in the Scotch coal measures was known many years previously, no attempt was made to turn it to account until the year 1760, when the Carron Ironworks were established. Only one kind of ironstone was then used—namely, the argillaceous or "clayband;" for the more valuable carbonaceous or "blackband" was not discovered till the beginning of the present century. These two varieties are known as the coal measure iron-stones, and are found in all the great coal fields of Britain except those of Northumberland, Durham, and Lancashire. 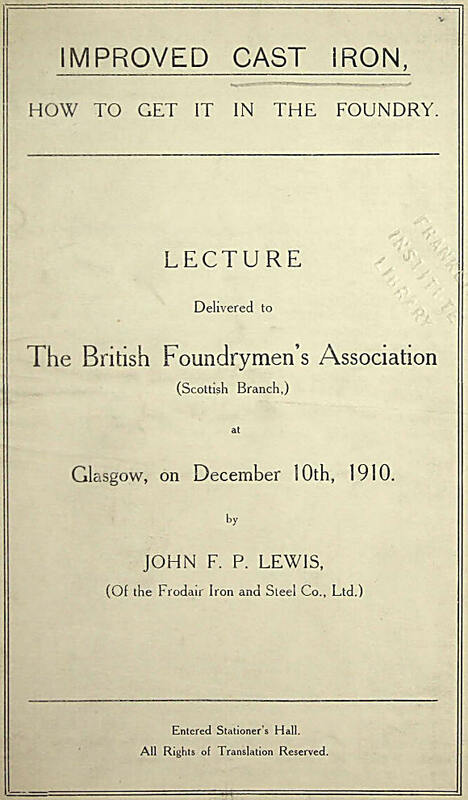 Though there are nineteen kinds of iron ore known to the mineralogist, it has been calculated that nine-tenths of the iron produced is derived from the clayband and blackband ironstones, the relative value of which is thus stated in a paper read before the Scottish Society of Arts by Mr Ralph Moore, Government inspector of Mines—"Clay ironstones contain from thirty to fifty per cent. of metallic iron. Before being melted, they are mixed with coal, and calcined in kilns or large heaps, to drive off the carbonic acid gas, sulphur, and other impurities. This description of ironstone is found in seams or bands, and in nodules, throughout the whole of the measures, but is most plentiful in the lower part of the section. Blackband ironstone is a carbonate of iron, laminated with coal, generally in sufficient quantity for calcination without further admixture of coal; and leaves, when calcined, a metallic coke containing from fifty to seventy per cent. of metallic iron. This description of ironstone is found in seams or bands in well-defined positions in the measures, but these are neither persistent in position nor equable in quality. Sometimes the seam is wanting altogether, or so thin as to be unworkable; at other times, the coaly element so predominates that its metallic value is of small amount, while not unfrequently it contains nothing but coal. A good blackband ironstone contains from two to eight per cent. of coal. When it contains more than twenty per cent of coal, it is of little value unless mixed with clayband, which uses up the excess of coal. It is more easily melted than clayband, and requires less coal; and the weekly produce of a furnace from blackband is fifty per cent. greater than from clayband." Deposits of hematite, or red iron ore, have been discovered recently in Haddingtonshire, Dumfriesshire, and Kirkcudbright, and operations for utilising the ore are in progress. From the establishment of the Carron Ironworks in 1760 till 1788, the quantity of iron produced in Scotland did not exceed 1500 tons per annum; but during the succeeding eight years a number of new furnaces were erected in the counties of Lanark, Fife, and Ayr. In 1796 the number of furnaces was seventeen, and the quantity of iron made in that year was 18,640 tons. Thirty-three years afterwards the production had reached 29,000 tons; and from that figure the invention of the hot-blast process raised it to 75,000 tons in 1836. By that time the construction of railways had begun to open a new market for the iron-merchant; and to supply the demand, many new iron-stone pits were opened, and furnaces erected. In the ten years from 1835 to 1845, the production of iron increased about 700 per cent.— the quantity made in the latter year being 475,000 tons. Ten years later, 825,000 tons were made; and another decade gave an addition of 339,000—the quantity manufactured in 1865 being 1,164,000 tons. Over speculation, and the consequent financial crisis in 1866, operated most prejudicially on the iron trade, and the production for that year fell to 994,000 tons. Matters gave promise of taking a turn for the better in 1867; but the promise was realised only to a limited extent, the revelations made in connection with several of the principal railway companies, and other causes, having had an unfavourable effect on the trade. The total quantity made in 1867 was 1,031,000 tons—an increase of 37,000 as compared with the preceding year, but 133,000 tons short of the production of 1865. The quantity shipped in each of the past ten years has not varied much. In 1867 it was 593,277 tons, of which 338,364 tons were for foreign ports, and the remainder went coastwise. Of the quantity shipped to foreign ports, France took 60,500 tons; Germany and Holland 99,600 tons; Belgium, Denmark, Sweden, and Norway, 20,100; Russia, 9600; Spain and Portugal, 5100; Italy, 14,200; United States, 117,300; British America, 43,000; East Indies, China, Australia, and South America, 14,000. The largest quantity ever consumed in Scotland in one year was 532,000 tons, in 1865. In 1867, the quantity taken was 420,262 tons. The make of malleable iron in 1867 was 142,800 tons, being a reduction of 11,400 tons as compared with 1866. 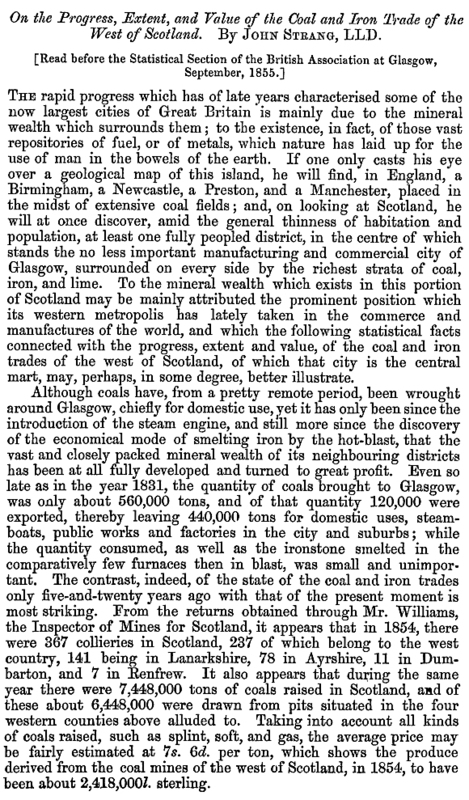 The rapid development of the iron trade has not been peculiar to Scotland. England, Wales, and a number of Continental countries have had a similar experience, arising from the same causes—namely, the formation of railways, the substitution of iron for wood in the construction of ships, and its increased application, in the form of machinery, to the industrial arts. The number of blast furnaces in Scotland is 164, of which 108 were in blast during 1867. Each furnace produced on the average about 9546 tons. One furnace gives employment, directly and indirectly, to fully two hundred men and boys, so that the number of persons engaged in the production of pig-iron dining the year could not be less than 22,000, with wages ranging from 2s. to 6s. a-day. It will thus be seen that the " damping out," or stoppage of a furnace is a serious matter for the working population in the iron districts. Were the entire number of furnaces in blast, employment would be given to upwards of 33,000 men and boys, while the annual production would exceed 1,500,000 tons. The number of ironstone miners in Scotland is about 13,000, and the largest quantity of ore put out in a year was 2,500,000 tons in 1857. The occupation of the ironstone miner differs little from that of the coal-miner, and the two occupy nearly the same position as regards wages, &c. The ironstone seams are generally only from six to eighteen inches in thickness, so that in taking out the ore a considerable quantity of rock has to be excavated. As the miner advances, he builds up behind him as much as possible of the stone and rubbish, and sends out the ironstone and surplus material in small waggons or "hutches." the price at the close of 1866 was 54s. 6d. In order to enable them to overcome the effects of the crisis brought about by the speculators alluded to, the ironmasters resolved to reduce the production, and forty furnaces were "blown out." Nearly eight thousand men and boys were thus thrown idle, while at the same time the wages of the men retained were considerably reduced. In the course of 1867 a number of the furnaces which had been stopped were set on, and about one-third of the men who had been thrown idle were restored to work. The average price of pig-iron during 1867 was 53s. 6d. per ton. The lowest figure reached in the course of the year was 51s. 3d., in the month of March, and the highest 55s. 6d., in October. 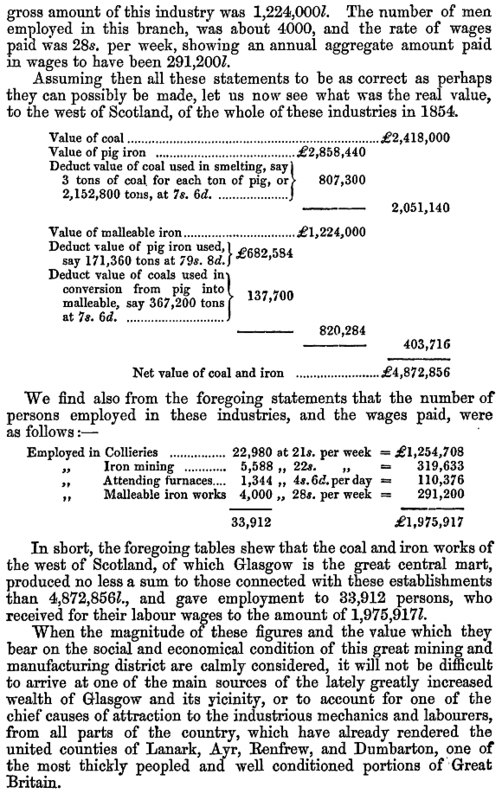 From the convenient situation and facilities for transport enjoyed by Scotch ironmasters, coupled with the cheapness of labour, it might be thought that no English or other producers of the metal could undersell them; but it is, nevertheless, a fact that something like 70,000 tom of pig-iron were in 1867 imported into Scotland, from Middlesborough, in Yorkshire, where ironstone costs less than one-fourth of its value in Scotland. The iron is, however, of a much lower quality than the native Scotch, and is used for mixing with the latter for the production of certain kinds of material. A small quantity of fine pig-iron is brought from West Cumberland by some of the malleable iron makers, who use it to mix with and improve the quality of the native iron. It is expected that, when the Solway Junction Railway is opened, a large quantity of Cumberland iron ore will be brought into Scotland. In 1868 the price of malleable bars ranged from L.6, 15s. to L.7, 5s. a ton; plates, L.8, 10s. ; and rails, L.6 to L.7. Cast-iron pipes were quoted at from L.4, 15s. to L.6 per ton, and railway chairs at from L.3, 12s. 6d. to L.4. 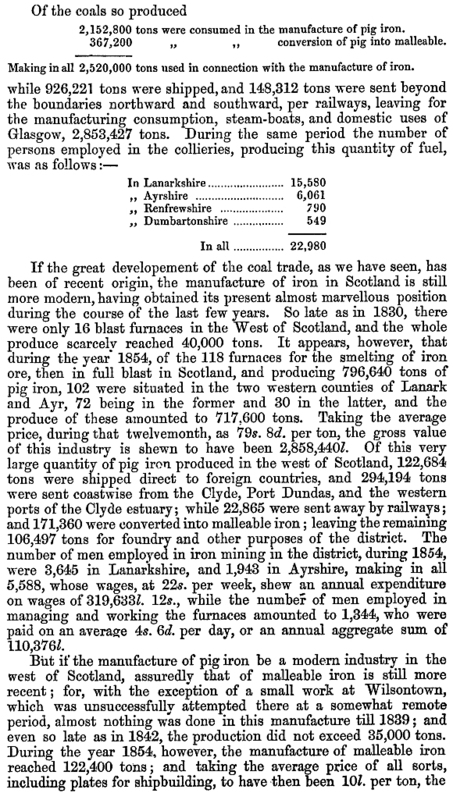 The most valuable deposits of ironstone are in Lanarkshire and Ayrshire, and in the former county two-thirds of the pig-iron made in Scotland is produced. The blast furnaces are chiefly concentrated in the vicinity of Coatbridge, Airdrie, and Wishaw, all of which towns were rapidly raised to importance by the development of the mineral treasures which lay beneath and around them. Coatbridge stands within a crescent of blast furnaces, and in the town are a large number of rolling mills, forges, and tube works, the hundred chimneys of which form quite a forest of brickwork capped with fire. Though Coatbridge is a most interesting seat of industry, it is anything but beautiful, Dense clouds of smoke roll over it incessantly, and impart to all the buildings a peculiarly dingy aspect. A coat of black dust overlies everything, and in a few hours the visitor finds his complexion considerably deteriorated by the flakes of soot which fill the air, and settle on his face. To appreciate Coatbridge, it must be visited at night, when it presents a most extraordinary and—when seen for the first time—startling spectacle. From the steeple of the parish church, which stands on a considerable eminence, the flames of no fewer than fifty blast furnaces may be seen. In the daytime these flames are pale and unimpressive; but when night comes on, they appear to burn more fiercely, and gradually there is developed in the sky a lurid glow similar to that which hangs over a city when a great conflagration is in progress. For half-a-mile round each group of furnaces, the country is as well illumined as during full moon, and the good folks of Coatbridge have their streets lighted without tax or trouble. There is something grand in even a distant view of the furnaces; but the effect is much enhanced when they are approached to within a hundred yards or so. The flames then have a positively fascinating effect. No production of the pyrotechnist can match their wild gyrations. Their form is ever changing, and the variety of their movements is endless. Now they shoot far upward, and breaking short off, expire among the smoke; again spreading outward, they curl over the lips of the furnace, and dart through the doorways, as if determined to annihilate the bounds within which they are confined; then they sink low into the crater, and come forth with renewed strength in the shape of great tongues of fire, which sway backward and forward, as if seeking with a fierce eagerness something to devour. The most extensive ironmasters in Scotland are Messrs Baird and Co., who own forty-two blast furnaces, employ nine thousand men and boys, and produce about three hundred thousand tons of pig-iron per annum, or one-fourth of the entire quantity made north of the Tweed. Twenty-six of their furnaces are situated in various parts of Ayrshire, and the remaining sixteen are concentrated at Gartsherrie, in the neighbourhood of Coatbridge. Gartsherrie Ironworks are the largest in Scotland, and it is stated there is only one establishment in Britain which has a greater number of furnaces. The quantity of pig-iron made is one hundred thousand tons per annum, and the number of men and boys connected with the works is three thousand two hundred. More than a thousand tons of coal are consumed every twenty-four hours; and, as showing how well chosen is the site of the works, it may be mentioned that nineteen-twentieths of the coal required is obtained within a distance of half-a-mile from the furnaces. One coal-pit is situated close to the furnaces, and has been in operation since the works were established, forty years ago. The coal from this pit is conveyed to the furnaces by means of a self-acting incline. Most of the ironstone was at one time obtained from pits in the nighbourhood, but now it has to be brought from a distance of from two to twenty miles; and a complete system of railways connects the pits with the works. The total length of the railways is about fifty miles, and the traffic is carried on by means of six locomotives and an immense number of trucks. The establishment is also connected with the great railway systems of the country, and possesses additional facilities for transport in a branch of the Monklands Canal, which has been carried through the centre of the works. For the canal traffic, there is a fleet of eighteen barges, of about sixty tons each; and eight of these are screw steamers. A great proportion of the manufactured iron is sent out by the canal. As the Gartsherrie Ironworks have a wide-spread reputation for producing iron of a superior quality, and are among the best organised manufactories in the country, a description of them may be interesting. The furnaces, sixteen in number, stand in two rows, one on each side of the canal, and about forty yards distant from it. A constant supply of coal and ironstone can be reckoned upon, and therefore only a small stock is kept at the works. The mineral trains are worked with unfailing regularity, and their cargoes are deposited conveniently for immediate use. There is thus no superfluous shovel¬ling about of the materials, nor is any expense incurred by piling them into heaps. The proportions of ironstone, coal, and limestone, laid down are exactly what are required in the process of smelting. Manual labour has, by a variety of ingenious appliances, been reduced to a minimum, and the amount of waste is infinitesimal. Everything is done according to a well-defined system, and nothing connected with the works is considered to be too insignificant to merit attention. No heaps of rubbish are allowed to accumulate, no scraps of iron or cinder lie about, and every nook and cranny about the vast place is as tidily kept as it can possibly be. The workmen are liberally treated, but they must do their work carefully and well. Negligence and irregularity are unfailingly punished, while merit is as certainly rewarded. All the men employed about the furnaces, even the firemen and engineers of the blast engines, are paid accord¬ing to the quantity and quality of iron produced. This arrangement is found to work admirably, as each man knows that, by attending to his work, he is not only putting money into the pockets of his fellow-labourers, but also improving his own earnings. Before the ironstone is ready for smelting it has to be calcined, which operation is performed at the pits. The object of calcining is to separate carbonic acid, water, sulphur, and other deleterious substances, which are volatile at a red heat; and it is performed in this way :—A layer of rough coal is first laid down, and on that the ore, mixed with a certain quantity of small coal, is piled. The blackband ironstone, as it contains a large proportion of carbon, requires less coal to calcine it than the clayband. When the heap is completed, fire is applied to the windward side, and combustion goes on gradually until the desired effect is produced. When the ore cools, it is ready for the furnace; but when the heat has been too intense, the ore is found to have run into large masses, the breaking up of which takes a considerable amount of labour. Having been built at different periods, the Gartsherrie furnaces are of various patterns. The general shape is cylindrical, the diameter twenty-two feet, and the height sixty feet. The Nelson Monument, on Calton Hill, Edinburgh, would, were it less lofty, bear a close resemblance to one of the most recently erected furnaces. The furnace is fed from the top, and, in order to protect the " fillers," the mouth of it is surrounded by a light wall of brick, pierced with convenient openings. This brick wall is so much thinner than the main wall of the furnace on which it stands, that a gallery or foot¬way several feet in width is left clear all round. Externally, there are four arched recesses in the base of the furnace, three of which are occupied by the "tuyeres," or pipes conveying the "blast;" while the fourth contains a doorway by which the "slag" is drawn off, and also the opening through which the molten iron is discharged. The interior of the furnace consists of a circular cavity, seven and a half feet in diameter at the lower part or hearth. At a height of five or six feet from the bottom of the hearth, the cavity begins to increase in diameter, until, at half the height of the furnace, it measures eighteen feet across. It is then gradually contracted, and at the top the diameter is eleven feet. The materials with which the furnace is fed are roasted ore, coal, and limestone. The proportions of these vary according to their quality. In some cases, a small quantity of red-iron ore or hematite is used along with the blackband ironstone, and then the proportions of what are called a "charge" are these:—Coal, about 10 cwt. ; roasted ore, 6 cwt. ; red ore, cwt. ; and lime, 21 cwt. About sixty "charges" are thrown into the furnace in the course of twelve hours, and at six o'clock in the morning and at six at night the furnace is " tapped" and the iron ran off. The chemical changes undergone by the materials introduced into the furnace are thus described:—The iron ore consists of iron, oxygen, and sand, and the object of the iron smelter is to separate the two latter substances from the former. The coal introduced has two functions to fulfil—in part it is burned so as to raise the contents of the furnace to such a high temperature that they will be enabled to act on each other; and, at the same time, it carries away the oxygen which was originally in combination with the iron in the roasted ore. The lime plays the part of a flux, and combines with the sandy matter to form a slag. During the whole operation, hot air is being constantly forced in at the lower part of the furnace, so as to aid in the necessary combustion. The roasted iron ore being thus deprived of its oxygen by the coal, and of its sand by the lime, allows the other constituent—the iron—to trickle down through the mass of red-hot cinders to the lower part or hearth of the furnace. In front of each furnace is a level piece of ground covered with coarse sand, in which before the " tapping" takes place a number of small furrows are formed. These communicate with larger channels leading from the opening in the furnace; and when the iron is let out, it runs along the main channels in a glowing, bubbling stream, and distributes itself into all the hollows. The large channels are called "sows," and the small ones "pigs;" hence the term "pig-iron." Two men are employed to feed each furnace. One fills half a charge of coal into a large iron barrow, and the other half a charge of the other materials into a second barrow. The men and the barrows reach the staging communicating with the mouth of the furnace by means of a hydraulic lift. The coal is thrown in first, and the other materials immediately afterwards. The occupation of the "fillers " appears to be a somewhat dangerous one, as the flames at times shoot out upon, and almost surround them. Two men are employed at the hearth scooping out the slag and cinders with a huge spoon suspended from a crane, and from time to time stirring up the contents of the furnace. This is very severe labour, and the faces of the men engaged in it have a half-roasted appearance. The slag is poured into iron trucks, and, when it consolidates, is wheeled away to be emptied on the waste heap—which, it may be mentioned, contains as much material as would build a copy of the Great Pyramid. The pig moulds are formed in the sand by boys, the operation being a very simple one. Up till about forty years ago the air forced into blast-furnaces was cold, and the process of smelting was slow, and also costly, in consequence of the great quantity of coal that was required. In 1827, Mr J. B. Neilson, engineer of the Glasgow Gas-Works, conceived the idea of heating the air before injecting it into the furnace; and two years afterwards a most successful trial was given to the invention at the Clyde Ironworks. With the cold blast coke had to be used, and 8 tons 11 cwt. of coal converted into coke was required to reduce one ton of iron. It was found that when heated air was employed the coal might be used raw, and that 2 tons 13f cwt. was sufficient to smelt a ton of iron, including 8 cwt. required for heating the air. This discovery gave an extraordinary impetus to the iron trade, and the patentee and his partners are said to have realised L.300,000 by the invention. At Gartsherrie there are three immense engines for generating the blast—two for one range of furnaces, and one for the other. The engines are on the beam principle, and their united " duty" is equal to about 500 horse power. The steam cylinder of the largest is five and a-half feet in diameter, and ten feet deep, and the air cylinder is ten feet in diameter and depth. The air cylinders are simply gigantic pumps, which force the air into receivers, whence it flows at an equal pressure through the tubes of the heating oven, and into the furnace. By passing through the oven the temperature of the air is raised to 800°. It has been calculated that the quantity of air thrown into a blast-furnace in full work exceeds in weight all the solid material used in smelting. In the vicinity of Gartsherrie there are about five hundred houses belonging to Messrs Baird & Co., and occupied by their workmen. Nearly all the houses have two apartments, and a few have a third room. A bit of garden ground is attached to each house, and all are supplied with water and gas at a cheap rate. The miners get as much coal as they require without payment—only they must dig it out for themselves; and the other workmen are charged only 3s. 6d. for a cartload. Liberal provision is made for the education of the children of the workpeople. There are three schools in direct connection with the works, each being divided into separate apartments for infants, boys, and girls. The workmen seem to appreciate highly all that has been done for their welfare, and few of them leave the place. They own one of the most successful co-operative stores in the country. It is managed by a committee of the workmen, but its prosperity is in a great measure owing to the fostering care of the employers, who, however, have no interest in the concern beyond seeing that it is properly conducted. There are seven hundred members in the society, nearly all of whom are heads of families, and the business done amounts to about L.1200 a-month. In addition to general grocery goods, wines, spirits, butcher meat, and potatoes, are sold in the store. Of the many problems with which the ironfounder of to-day is faced perhaps the most important, and certainly the most interesting, is this: Can the quality of Cast Iron be improved to an extent sufficiently to raise its value and extend its function in the eyes of the mechanical engineer? 1 claim that the answer to this question is: Yes. 1 want to show that this question has proper warrant for its introduction into the deliberations of this Association; that touching the interests of the ironfounding industry it is a useful and even a vital question. During recent years Cast Iron has been gradually superseded tor many important component parts of mechanical constructions by other metals and alloys. The question is : Is this entirely the result of the establishment of strength or physical quality specifications which under any circumstances would have put Cast Iron out of court, or only partly the result of that and partly the result of failures on the part of Cast Iron owing to its being inferior in its own kind or defectively manufactured. Now, in answering this, it is not possible in this lecture to take you over the whole range of mechanical constructions and discuss where or where not it would be possible to employ Cast Iron; it will be sufficient to cite one or two concrete instances in which there are good practical reasons for supposing that Cast Iron might have held against steel or wrought iron or phosphor-bronze, or some other more costly metal or alloy, certain ground which it has actually lost. 1 can, for instance, find hydraulic cylinders made of steel which might have been constructed of Cast Iron without an unwieldy section had the founder been able to guarantee a certain tensile strength well within the known compass of Cast Iron. I can find working and bearing parts of engines, such as slidebars, motion-blocks, eccentrics, etc., made of steel or case-hardened wrought iron where Cast Iron of the right hardness, tenacity and density would have been equally, if not more, satisfactory. I can find steel, etc., being more and more specified for superheated steam fittings, whilst careful experimenting shows that Cast Iron of the best quality is just as suitable. I can find the more homogeneous and expensive metals in use for parts of meters, freezing plant and pneumatic engines, where iron is quite capable of meeting the necessities as regards density and strength, and I can sometimes find highly expensive alloys used for pots, retorts, kettles and other vessels subject to strong acid or alkaline reactions, or to the penetrating or erosive action of fumes, gases and vapours, where iron of the right chemical composition and properly manufactured would be at any rate a much more economical material. The improved Cast Iron suitable for work of this description must be superior to ordinary commercial qualities in the following respects : It must have a much higher specific weight; it must be freer from those impurities, particularly free carbon, which interrupt the crystalline continuity of its structure; it must be more regular in its structure over large masses, that is to say it must, though it cannot strictly be so, be much more nearly similar in physical character to the metallic condition known as solid solution. An ordinary commercial Cast Iron will have a tensile strength of 8 or 9 tons per square inch, and a specially good iron will have a tensile strength of 12 tons, and the average specific density of grey iron castings will be about 7. It the ironlounder can turn out with certainty an iron having a constant tensile strength of 15 or 16 tons and a constant specific density of 7.25, he will hnd that he has a material capable of competing with steel in many spheres where that metal now holds the field; providing this iron possesses certain wearing qualities which will be exhibited in its resistance to shock or abrasion, or to erosive actions, or to variations of temperature, or to intermittent stresses, and this combination of high tensile strength and high specific weight will almost certainly mean that it does possess these qualities. I am exhibiting here this evening a few specimens of Cast Iron which have shewn under careful test the tensile strength and specific weights mentioned. The official figures relating to these tests accompany the samples, and the only further comment I need make on these samples is that this material is quite easily machinable with good tools. I want to show how such an iron can be turned out commercially in the foundry, and first of all I must say that it is not a question of getting these results once, but always. It is quite common in the foundry to get an exceptional result occasionally, but a series of tests nearly always shews a very great variation between the maximum and minimum results, and outputs of iron which show wide ranges of quality are worse than useless, and in my opinion are a particular source of danger to the trade. It is these wide variations in quality which prejudice Cast Iron, since the engineer with an unreliable material must base his calculations on the lowest quality he has cognizance of in the material delivered to him. It, therefore, has no influence on the Engineer if he is told a certain iron will give up to 16 tons tensile as long as he knows that other specimens in the same batch may only give 8 tons, or that one casting is hard and tight as a drum if he finds that another is soft and porous, and this irregularity in Cast Iron is at the root ol the whole question and points the morals, since it means either that the founder’s raw material is variable in quality or that his melting and manufacturing processes are insufficiently understood or unscientifically controlled, or that both his raw material and his processes are variable and defective. Now, first of all, I w^ould like to discuss the material from which our high grade iron can be produced, and afterwards the methods which should be followed in producing it. I, therefore, must plunge now into the much vexed question of pig iron and pig iron mixtures. I think we may classify our choice of raw materials in 3 great headings :—(1) Consisting of pig irons of first smelting and scrap iron (i.e., pig once cast); (2) consisting of either part pig iron and part pig iron or pig iron and scrap re-melted, or wholly of remelted pig iron or of re-melted pig and scrap; (3) of any of the preceding along with steel or wrought iron in any shape or form. Of these three I am going strongly to advocate the first, i.e., mixtures of pig iron proper and scrap, and I will give reasons for choosing this system and for rejecting the others. With reference to the mixing of steel, wrought iron, etc., my chief objection to this is that it throws a responsibility on the staff and plant in the foundry which the foundry staff and plant are often unable to sustain. And here I wish it to be specially understood that 1 am not addressing myself to specialists here nor to those who are exceptionally skilful in foundry arts, nor to those whose foundry equipment and installations are exceptionally good, hut to the average foundry in which, as my experience goes, the facilities for really good and scientific work are by no means what they might be. It would be useless to put forward any propositions on the assumption that in every foundry there exist the most modern furnace and apparatus and that every foundry is equipped on the very latest lines of modern scientific foundry practice. What is food to one founder might be poison to another, and there is no way in which this could he better proved than by observing the results in different foundries of mixing steel with iron in the cupola. Additions of steel or other low carbon material to Cupola mixtures can only be successful where, firstly, the Cupola is of the best design and the blower and air connections of the proper size and arranged on the proper system, and secondly, where the foreman and moulders are skilled in carrying large bodies of metal almost immediately it is melted at very high temperature from the Cupola to the moulding floor and have the necessary equipment in the way of cranes, ladles, etc., to enable them so to do. The result of adding steel to iron in foundries where the Cupola will not melt quick and hot, and where perhaps there are not even blowing facilities for such melting, and where there is no arrangement for disposing immediately of fairly large bodies ol molten metal, is sure to be disappointing. A temperature sufficiently high properly to melt and fluidise the steel is not commanded and it will not mix thoroughly with the iron, and through slow melting the steel will absorb great quantities of carbon and sulphur. This means a patchy casting, hard and soft, weak and strong, and probably containing more deleterious impurities than if nothing but iron had been melted. I would like also to add, here, in relation to those cases of well equipped and skilfully managed foundries, where mixtures of iron and steel are used with success as regards the density, homogeneity and strength of the castings produced, that such products will from the important point of view of hardness and resistance to abrasion be inferior to the best Cast Iron. Moreover, I do not think that, although tensile and transverse strengths may be considerably raised they will be raised consistently above the limits obtainable by iron alone unless the melting be done in an air furnace or a crucible. My reasons, therefore, for rejecting the steel addition method are these: that it is only practicable in the most up-to-date and highly equipped foundries, and that it cannot give to certain castings to the same degree as iron alone that quality ol hardness which mav be described as resistance to wear and tear. With reference to that class of mixtures which consist wholly, or partly, of pig iron or pig iron and scrap re-melted, 1 condemn that absolutely as a regular practice for these reasons. The Cupola furnace is not in any sense of the word a purifying furnace, and should not be used as such. It is certain that what the founder may achieve in lowering Silicon by re-melting is at the cost of raising sulphur, and, furthermore, there will be in a well-blown, quick-melting Cupola a considerable loss of a valuable element, in which only too many foundry irons are seriously lacking to begin with, Manganese. The object of re-melting is to reduce the Silicon in the iron, and hence to close the grain. This object is achieved, but the process is a costly one, and if we assume the cost of melting iron in a Cupola to amount, all told, to 15/- per ton, it would seem distinctly possible for the founder to pay an extra 15/- per ton for his pig, and thereby obtain an iron of an analysis similar to that he expects to arrive at by re-melting. The inverse relation between Silicon and Sulphur will almost certainly be constantly exhibited in any Cast Iron melted in contact with coke, but the smelter will have more skill and a greater choice of method in bringing down a low silicon iron with a reasonable sulphur than the ordinary Cupola hand will have, especially if you are willing to pay him 15/- a ton extra for his product. The alteration in the physical qualities of Cast Iron by melting is the direct result of the changes in the chemical composition due to melting, and these changes are almost impossible to control accurately in a Cupola, and they will vary in their extent very considerably with variations in the composition and arrangement of the fuel or the iron charged, and with the oxidation to which the latter is exposed during the heat and the duration of the whole process. It, therefore, seems to me to be better to take originally pig iron of the Silicon and the approximate density required holding a known Sulphur than to take a higher Silicon pig than is necessary and melt it down twice, and this especially in consideration of the manganese which will be eliminated, since if we scheme to keep up the manganese in our metal we must begin with pig carrying very high percentages of it, and such pig will be certainly very high in Carbon. I therefore fall back on the old-fashioned system of mixing pig irons of first smelting and scrap, and I shall venture to indicate certain principles and methods by which our arrangement of such mixtures should be governed. And, first of all, I should like to say a word against that method which may be described as mixing, or grading, on the Silicon basis. When, a generation ago, the influence of Silicon on the iron-carbide system in Cast Iron was first discovered, it was clear that a most important scientific discovery in connection with the properties of iron had been made. It at once became apparent that the founder had been placed in possession of a secret by which he could much more readily control the hardness and softness of his castings than by any method previously known. The result of this was that founders at once chose Silicon as a sole basis for adjusting their mixtures and regarded it at once as the governing element; and this consideration of Silicon has persisted almost universally in foundries, and to my mind has brought the trade of iron founding in its connection with high grade mechanical construction almost to the verge of ruin. Silicon is certainly one of the governing elements in Cast Iron, but by no means the only one, and with the knowledge that exists to-day regarding the influence of the other elements, the effects of different treatment and different temperatures, the infinitely extended understanding of the forms in which carbon may be precipitated in iron, etc., it will be granted that the arrangement ol iron mixture on a Silicon basis is absolutely unscientific. By this method many matters of equal importance are overlooked. Surely an ironfounder called upon to make castings against a difficult specification would do better to review the effects of the whole of the foreign elements in his iron, to take into consideration how those elements will affect and be affected by his melting, how they interact, and how their presence or absence in certain quantities will govern the condition and behaviour of his metal when it is tapped and poured. The most fatal mistake that the ordinarily equipped founder can make when called upon to turn out castings of high mechanical quality is to mix high and low Silicon irons. It is against nature that such irons should melt together or mix together. To bring up a percentage of hard, low Silicon iron with a percentage of soft, high-Silicon iron, or to let down a percentage of soft, high-Silicon iron with a percentage of hard, low-Silicon iron is not “practical politics” as far as the average founder melting in the Cupola is concerned. I am speaking now of fine castings, such as those referred to bv me earlier on. The principal elements in Cast Iron are Silicon and Carbon, and it will be found that the melting point and specific weight of pig iron will be governed chiefly by these. I am almost prepared, then, to lay it down as an axiom that to get a really fine casting, and get it regularly, we must take nothing but irons for our mixture reasonably alike as regards their Silicon and Carbon contents. We shall as nearly as possible in all our irons fix our Silicon and Carbon at the figure we wish them to stand at in the mixture (and where we want strength and density these will both be very low), and we shall control hardness, which practically means the final condition of the carbon and its quantity, by careful adjustment of sulphur, manganese, and phosphorus. The second is, that we must be guided in the arrang-ement of our mixture not only by the theoretical effect of certain percentage of chemical elements on the finished casting, but also by the combined effect of those elements on the physical phenomena of melting and cooling. It is in the discovery of the correct balance between these two factors that I consider the whole problem of iron-founding lies. Supposing we pursue the chemical theory alone as applied to Cold Cast Iron, we shall be tempted to take the purest possible pigs, especially as regards sulphur and phosphorus, so that we may get a casting as nearly approximating steel in homogeneity as possible. This is no doubt an attractive idea, but unfortunately we find that it is not easy to carry out in practice, since our metal, when melted by the Cupola, is lacking in fluidity, and, through want of heat and life, cannot expel its gases, slags or oxides before solidification, the result being blown or otherwise defective castings. It is useless, therefore, to persist with what 1 may term the “ irreducible-minimum ” theory of phosphorus and sulphur for ordinary Cupola-melted metal, though I quite admit that the dangers mav be less in one foundry than in another, according to the type and arrangement of the blow and the furnace and the skill of the operators. It is therefore necessary, in order to get a casting free from flaws and having a close and regular molecular structure throughout, to introduce more of those elements into our iron that promote heat and widen the range of fluidity of our metal, and we shall find that the elements most useful in that direction are manganese and phosphorus. We shall find that both of these may be raised to an astonishing degree, even where sulphur is already high, without injuring strength, providing always that the melting is properly done and that full advantage is taken in the casting operations of the liveliness and fluidity of the metal yielded, and as long as the graphitic Carbon in the casting is really low. The gist of this principle is this: that the final specific density of the casting will be the index of its mechanical and physical qualities rather than its chemical analysis, within, of course, reasonable limits, and this specific density is more easily achieved with a hot fluid and lively metal holding fair quantities of phosphorus, manganese and sulphur than with an ideal iron almost free from these elements. The question might possibly be asked, if fluidity is the secret of success, will not a high Silicon mixture give us that fluidity? The fluidity ofsilicious iron is too well-established a fact to be traversed by me, but my own practical experience is that the fluidity of Silicon, though very great while it lasts, is narrow in range, and that the solidification of silicious iron is more rapid once a certain amount of heat is lost than the solidification of phosphoric or manganiferous metal. The best proof of this lies in the well-known phenomena which we call liquid shrinkage in molten iron. This liquid shrinkage or suction is certainly reduced to a minimum in high Silicon mixtures, whereas all founders are familiar with the rapidity and duration of it in strong- irons, and particularly with high manganese. Personally, there is nothing 1 view with more satisfaction when my mould has been filled with white-hot metal than the sinking of the metal in the dead-head and feeders, providing I am satisfied that my moulding material is sufficiently refractory and porous, and that the whole structure is properly vented. I do not pretend here that I am uttering the pure milk of the scientific world; I am merely mentioning matters of practical experience. I do not understand the phenomena governing the fluidity of irons of different chemical composition, but I do know that it is extremely difficult, if not impossible, for me to get a tight casting of high specific weight with silicious iron, however fluid, and that it is easy for me to get it with a low silicon iron fairly high in manganese, sulphur and phosphorus. Now you will have gathered that I hold that in order to get a considerably improved Cast Iron such as is represented by the samples and figures laid before you to-day, certain conditions are necessary. The different irons in the mixture must all have a low silicon. They should, if possible, all have a low Carbon, but in any case the final total carbon figure of the mixture must be low. The mixture should be rich in Manganese and fairly rich in phosphorus. The Sulphur may stand at a higher figure than that generally considered as the limit by the analyst. 25% of COLD BLAST Pig. 25% of Hard Selected Grey Scrap. FRODAIR is a dense iron carrying a low Silicon and a very low Carbon, but melting very hot and fluid by reason of fairly high percentages of phosphorus and manganese. Sulphur about ott%. BEARCLIFFE is a tough iron of the true Hematite class carrying about 1% of Silicon, a moderate Carbon, low phosphorus and high manganese. Sulphur about 12%. The COLD BLAST used is a coke iron with the typical Cold Blast analysis, very low Carbon and Silicon, medium phosphorus, sulphur and manganese. SCRAP IRON used for the job was not analysed but taken on trust. It was judged to hold low Silicon, medium carbon, high sulphur, medium phosphorus and manganese. In the mixture 30% of FRODAIR is taken to make absolutely sure of the heat and fluidity of the metal and as a really low carbon basis for the specification; 20% of BEARCLIFFE will keep phosphorus within safe limits and will help fluidity by reason of its manganese; 25% of COLD BLAST is now added to restore the carbon figure which has been raised somewhat by the BEAR-CLI FEE, to keep sulphur within reasonable limits, and to guard against extreme hardness. These last two irons give most of the strength and toughness to the mixture. The scrap is used as an economy, and as much of it might have l>een taken as the carbon and sulphur figure in the specification would have allowed. All the components have about the same Silicon. With these irons mixed in this manner castings can be produced which would, I think, answer many purposes for which steel to-day is used. Supposing for the moment it be granted that this proposition is warranted and that it is open to any founder present to use this kind of mixture and extend his business in high grade castings for steam, hydraulic, pneumatic, oil, gas and other engines and plant and other branches of mechanical constructions, let us for a moment discuss the methods by which such a mixture can best be melted and cast. The first essential point is, that the melting be done as rapidly and as hot as possible. The great trouble in many foundries is that the Cupola will not melt quickly and falls a good deal behind its scheduled capacity in this respect. I would advise all those who are troubled in this way to tackle their whole melting installation from the motor or engine to the Cupola spout circumstantially, comprehensively and scientifically. The failure wi generally he due to the blast, and not by any means to lack of powrer or pressure, but probably, on the other hand, to too much of those, the great bulk of which will be represented by inadequate tuverage and resistance at the furnace and in the pipe connections. The plan I would suggest to regulate this important matter is quite simple. Calculating at 35,000 ft. of air for each ton of iron melted, reckon what quantity of air per minute the blower or fan should deliver at its outlet in accordance with the scheduled caparity of the Cupola, that is to say, the weight of iron it should melt within a given time, then see that you have a blowing machine so devised as to deliver that quantity of air at that velocity which is judged necessary to convey it freely into the furnace, presuming that your pipes, wind box, and tuyeres are soregulated in shape and area as to offer a negligible resistance to the action of the blower. This velocity will varv somewhat with the size of the furnace i.e., with the distance which the air has to travel after its first obstruction b} the charge. The flow of air under pressure is a question very little understood in the foundry, and most foremen would be astonished if they knew what vast quantities of air will flow at high velocity through, say, 10-inch unobstructed pipes under a very few ozs. of pressure. The foreman should fix his pressure gauge on his blast-pipe just before it joins the fan casing, and .this, I submit, is the only useful place in which a foundry gauge can be placed. He then gets the indication he wants, i.e., the amount of air his fan is delivering, because a given velocity is the result of a given pressure and the volume is according to the velocity when the area of the pipe is known. However, supposing we imagine that the air has free exit into the furnace through the wind-box and tuyeres, there will still be some loss of the effective work represented by the pressure at the fan through friction in the connections, and this will vary according to the length of the connections and their angles and bends. These latter are almost impossible to reckon with accurately, and all I can say is, have no angles or bends; but the loss by friction in a fairly straight pipe can be estimated and can be provided for by a higher initial pressure, or by the requisite increase in the size of the pipe in the direction of the Cupola. The theory then is : let the blow^er deliver the right quantity of air at its outlet, make sure that this air passes under all circumstances freely into the Cupola, and this can only be done by having your total tuyere area two or three times as great as the area of the blower outlet so that there may be a veide margin for stoppages in front of the tuyeres throughout the heat. It may be asked, how are we to know what quantity of air is delivered by our blowers? Either you must find a firm supplying these instruments upon whose statements you can absolutely rely, or vou must learn to calculate for yourselves, and this latter is by far the best way. As regards Centrifugal fans vou will find all the necessary instruction and information in Kinealy’s book, set forth in a lucid, practical and fairly popular way, and by studying the arguments and formula therein you will soon be enabled to find what volume of air is represented by the pressures registered on your gauge. Neither time nor the title of this lecture permits of my dealing with the economical aspects of this question of blast supply. I have merely mentioned the matter here because I believe it is at the bottom of nearly all bad melting, and because, for the purposes of our improved Cast Iron, we must have our mixture melted fast and melted hot. Now, having brought down our mixture white hot we must get it into the mould as nearly as possible at that heat, that is to say, we must pour our metal as hot as ever we can get it. I do not believe in the dull metal theory of casting. I suppose we could all quarrel very much about this question of pouring temperature; metallurgists, experts, chemists, melters and moulders are always discussing it and disagreeing about it. My own experience is, the hotter the casting temperature the better the casting as regards density and strength. If I am asked to say why, I can only offer a humble opinion; the phenomena of cooling* iron are too uncertain and complex to admit of more than this. I think that the hotter the iron the more the impurities are held in solution, i.e., that as the process of cooling proceeds molten iron throws out more dirt, or scum, or oxides. The hotter we pour our iron the more rapid is the cooling- process in the mould, that is to say, that the temperature will come down over a wider range in the same time with hot than with dull metal, and hence the time for oxidation and other re-actions is correspondingly reduced. Further, it must be remembered that there is a vast molecular activity in molten metal, and the greater the heat the greater that activity, the more complete the expulsion of gases. I do not think there is any temperature in iron melted in a Cupola which warrants a delay in pouring, and we must not look in this matter to steel-founding* for a lesson Steel is melted and cast at much higher temperatures than those attainable in the iron-foundry. Of course it is understood that the hotter the iron the greater must be the care and the wider the scope of venting, the more resistent and refractory the mould, and the more ample and skilful the feeding. The question may be put to me, in what practical way are iron-founders going to benefit by supplying an improved Cast Iron? I w ill answer that, to begin with, by another question. Has not the industry of iron-founding suffered both loss and dignity through the continual rejection of Cast Iron by engineers for all work where Specifications demand more than the British Admiralty tests for transverse and tensile strengths. What I claim is, that th*» potential strength and mechanical qualities of Cast Iron are much higher than what is demanded by the severest .Specifications laid down by modern engineers, and I argue from that that there is a big range of castings now lost to Cast Iron which can be brought back into the foundry as soon as the engineer can be convinced that higher Specifications can be met. Let us look at this for a moment in a practical way and take the case of cylindrical castings subject to internal pressure. For thin cylinders I take the ordinary engineer’s formula, i.e., thickness equals diameter multiplied by working pressure, divided by twice the safe working stress of the material. Now if we take 9 tons as the tensile strength of Cast Iron and a factor of safety of 6 (w'hich factor I wall adhere to throughout all cases) we get a divisor in our formula of 3 tons. Mr. Pettigrew, in his book on the locomotive (a standard work) reduces this to 3,000 lbs. i.e., under 2½ tons, so he apparently w ill not trust Cast Iron even to have a 9 ton tensile strength. However, we stick to our 3 tons, and taking a steam cylinder of 16-in. diameter and a pressure of 130 lbs., we find we require a wall thickness of 5/14 of an inch. 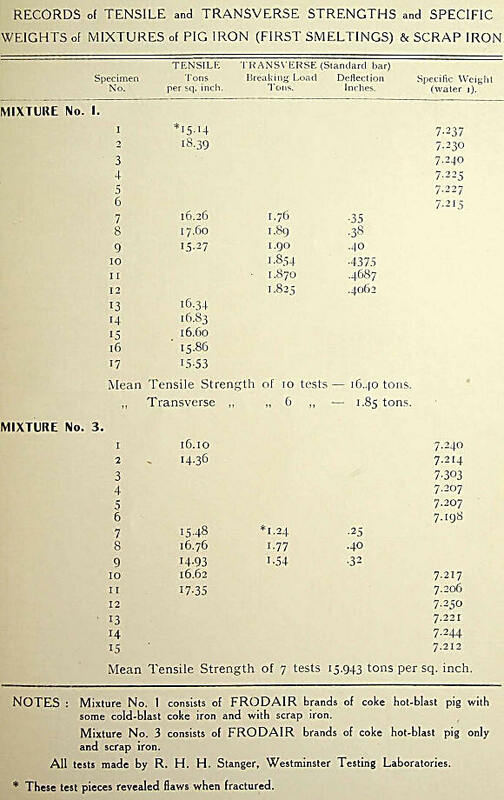 But supposing our Cast Iron will stand a 13 ton tensile test we then, by the same formula, get a necessary wall thickness of 3/14 of an inch—a saving of 2/sths in our material. For engine cylinders the thickness against bursting stress is, of course, largely reinforced by extra thickness against piston abrasion; our improved Cast Iron will have much better wearing qualities as well as much higher tensile strength, and the engineer will soon find he can also considerably cut down his allowance for re-boring. Take a hydraulic cylinder with a diameter of 8 inches and a pressure of 1,500 lbs. per square inch. For this class of construction, where the thickness of the metal will be great in proportion to the bore, we require another formula, since allowance must be made for the diminished stress on the outer layers of the cylinder wall. I use a formula kindly worked out for me after impartial consideration of the whole problem by an engineering friend of mine, Mr. Leslie Sadler, of Bradford. With Admiralty Cast Iron we get a wall thickness of 2.47 ins., with our improved Cast Iron we reduce this to 1.27 in., practically half. The section would, of course, be less with a good mild steel, but I submit that where an engineer might reject a section of, say, 2½ ins. in Cast Iron, he might adopt one of, say, 1^ in preference to steel. It is these direct and concrete considerations which lead me to urge founders to re-adopt the tensile test for Cast Iron. The transverse test is not a direct indication of the tensile strength. It is at the best only a comparative test, and is only of value in that respect in testing similar types of iron. The difficulty of the even grip and pull on the tensile test-piece has been overcome in the best laboratories, and the tensile test on the round bar is a much more reliable index of the quality of Cast Iron than the load test on a square bar. The square bar is a bad shape, its angles offending the most rudimentary principles of design in Cast Iron constructions. And further, and perhaps most important of all, it will be found that a high tensile record will never accompany that kind of hardness which means trouble in machining, so that this test will always keep the founder on absolutely safe ground when his castings get through into the fitting shop. Beyond the question of raised strength and decreased section and weight in castings there lie other possibilities. It is impossible for me to give a number of concrete cases; let it suffice to say that it is within our powers to issue castings of much harder and denser and more elastic material than the engineer is accustomed to receive from the iron foundry. By increased strength and density, and, above all, by greater regularity of quality and skill in manufacture, many of those strains and stresses and erosive, mordant and abrasive actions which it is the tendency of our age to meet by Steel may be met by Cast Iron. On the occasion of a recent visit to Norway—a country now making very great advances in the engineering industry—I was discussing the question of the size and section of iron screw propellers with a local firm of shipbuilders. My friend was complaining, and quite justly, of the great bulk and ungraceful shape of these and deploring the fact that the larger they were the more ugly and unscientific they looked. I ascertained that the Norwegian Lloyds prescribe beyond certain limits of dimension an extra half-inch of section of the blade shoulder for every extra 6 inches of diameter of the screw. The tensile test of the metal is only 8 tons. My proposition was, that for each succeeding- increase of 6 ins. in diameter there should be an extra ton of tensile strength in the iron, the section at the shoulder remaining the same I was asked to approach the Norwegian Lloyds with this suggestion. I did so, and it was accepted. Later 1 saw some propellers made by my. friend to the new specification, and the improvement in line and in driving efficiency was quite wonderful. Here was a case in which iron was getting a fair chance. The old method was simply a long step towards the abandonment of iron for bronze, because in the larger screw's the shape soon became so ugly and the bulk so enormous that the engineer would not have them at all; by the new method the iron founder was encouraged to improve his material and keep a hold on the orders. Perhaps 1 am offering a counsel of perfection, and 1 admit Ido not have to live by the profits of ironfounding—perhaps 1 am running my head up against a brick wall, still I venture to ask why not, instead of wildly competing in the direction of cheapness and ol the substitution of soulless mechanism for intelligent handicraft, compete to turn out a better iron to meet the advancing specifications of to-day; an iron reinforced against water-hammer in pipes and valves, against back-lash in gears, against the growth induced by variations of temperature, against the shock of the hammer and the fret of the piston, against the bite of acid and the sweat of heat.